2328 x Switzerland - extensive inventory packed in a carton, all in 20 mostly good filled approval books with a large amount of material, including numerous blocks of four mint never hinged respectively with centered postmark, special- and commemorative issues, Pro Juventute and Pro Patria, offices issues and so on. Favorable valued inventory with very high, five-digit catalogue value! 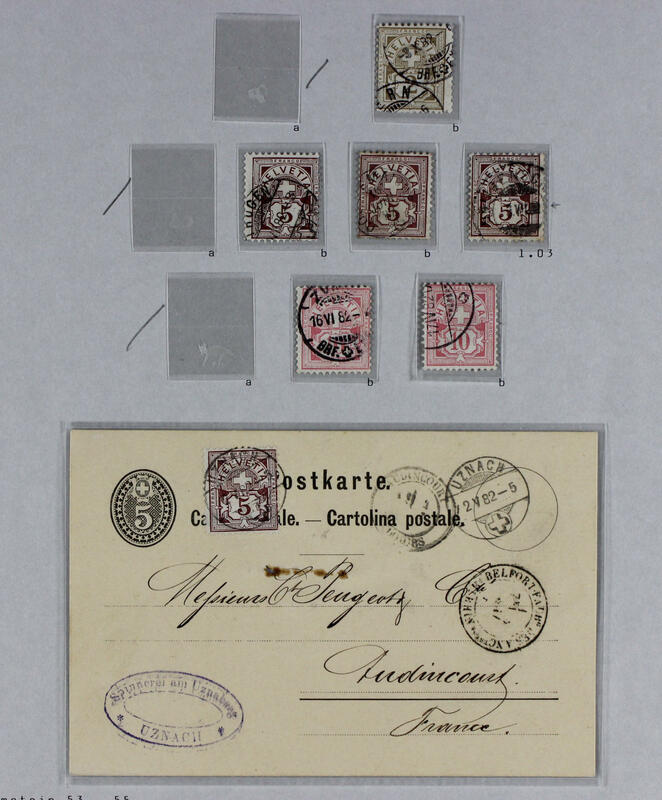 2329 x Switzerland - extensive inventory in 20 approval books accommodated, as well numerous blocks of four mint never hinged respectively with centric postmarks, Pro Juventute and Pro Patria, offices issues, airmail, postage due stamps and so on. Perfect for liquidation. Very high, five-digit catalogue value! 2330 x Switzerland - extensive inventory of particular stamps Pro Juventute and Pro Patria packed in a carton, all in glassine-bags, mostly in larger numbers of pieces, with also many older values from the twenties years, issues of the forties and fifties and so on. Large number of pieces and immense catalogue value! 2331 ✉ Switzerland - nice and extensive inventory from 420 covers and First Day Cover packed in a carton with many attractive documents, with also 15 Rp. Rayon III on cover from \"SION\", souvenir sheets and souvenir sheet stamps with useful issues, registered and so on. Treasure trove! 2332 ✉ Switzerland / picture postcards - huge inventory from approximate 3500 old picture postcards with numerous beautiful documents housed in moving box. With also numerous colored cards, various places, mountain scenes and so on. Favorable opportunity! 2333 x Switzerland - extensive lot packed in a carton. As well souvenir sheets from the forties years including Federal celebration souvenir sheet 1940, Pro Juventute with useful issues from 1915, Pro Patria blocks of four with centric postmarks, collection Pro Juventute blocks of four centric cancellation and so on. Favorable valued treasure trove! 2413F ✉ Switzerland / postal stationery - extensive lot postal stationery, predominantly older examples from Universal Postal Union 1900 with numerous documents Tell and Tell boy and so on, predominantly used issues packed in a carton. Large number of pieces! 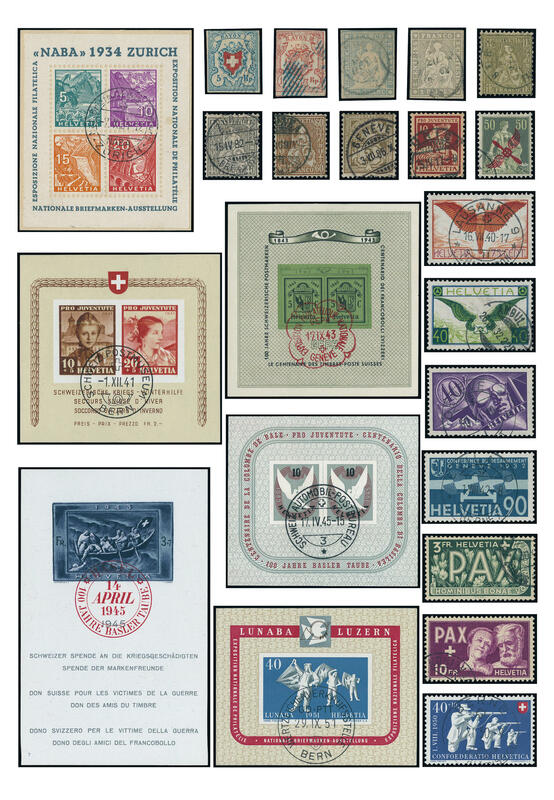 2424 ⊙ Switzerland - 1850 / 1984, extensive used collection with plenty of better issues, with also Rayon stamps, a good part Strubel, seated and standing Helvetia, better airmail stamps, NABA-block 1934, Pro Juventute souvenir sheet 1941 very nice canceled, Federal celebration souvenir sheet 1942 on special delivery letter, both Zurich souvenir sheets, Double Geneva souvenir sheet with red special cancel, Bale dove souvenir sheet 1945, war victims souvenir sheet 1945 with lovely red special cancel, PAX set 1945, Imaba souvenir sheet 1948, LUNABA-block 1951, Lausanne souvenir sheet 1955 and so on. A magnificent object with substance! Michel approximate 13000,- €. 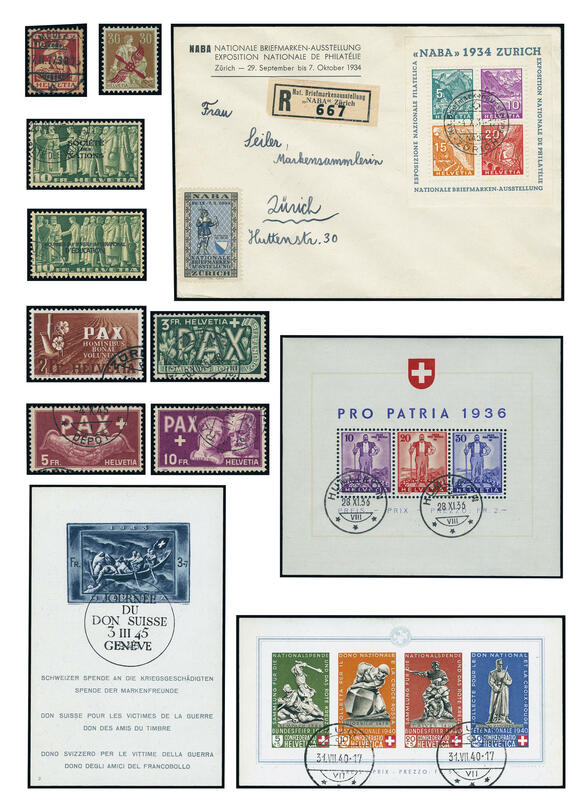 2451 ⊙/ /✉ Switzerland - 1907 / 78, extensive collection in the thick album formed with lots of material, with also a plethora of special- and commemorative sets, numerous blocks of four, NABA-block 1934 centric cancellation, PAX set 1945 used, LUNABA-block 1951 on illustrated First Day Cover and much further material. Favorable valued! 2510 ⊙/ / Switzerland - 1914 / 82, extensive lot of the Pro Juventute issues, stored in three stock books. 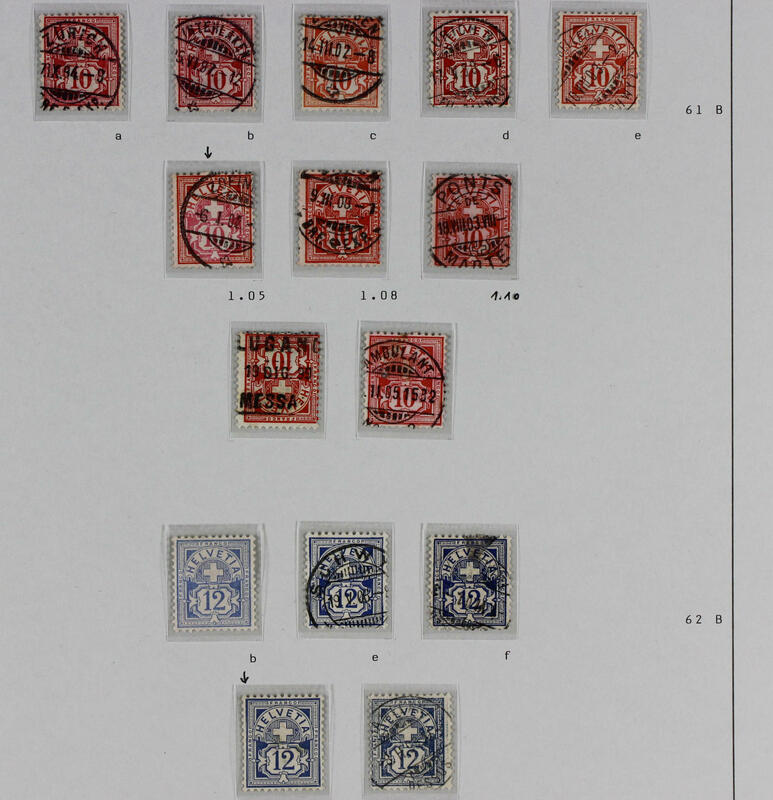 Also the early issues abundant be present including the set from 1915 seven times, 1916 six times, 1917 eight times, numerous coat of the arms sets, blocks of four, issues of the forties and fifties, butterfly series and so on. SBK approximate 20000.- Sfr. 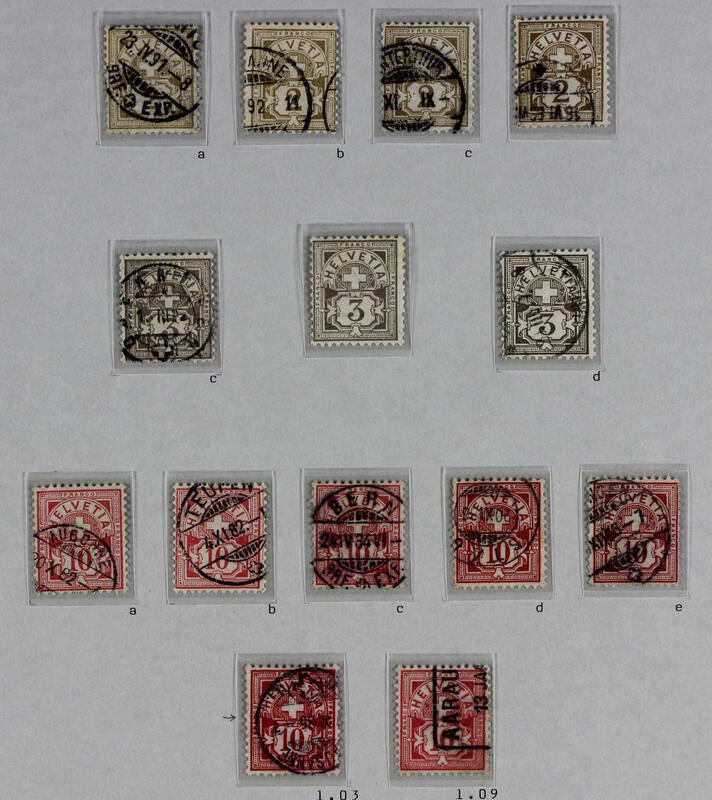 2511 ⊙/ / /✉ Switzerland - 1907 / 60, superb collection in two KABE albums formed, almost exclusively used including numerous better issues, with also both airscrew overprints, good Pro Juventute sets from 1915, airmail stamps from the twenties and thirties, NABA-block 1934 on beautiful registered cover the exhibition with appropriate special cancel, Pro Patria-block 1936 used, Federal celebration souvenir sheet 1940 used, Pro Juventute souvenir sheet 1941 with special cancel, Federal celebration souvenir sheet 1942 used, both Zurich souvenir sheets with red special cancellations, Double Geneva souvenir sheet with red special cancel, war victims souvenir sheet 1945 with special cancel, Bale dove souvenir sheet 1945 used, PAX set neat cancelled, LUNABA-block 1951 and a very nice part offices issues with good used sets. Magnificent object! 2512 ⊙ Switzerland - 1912 / 63, extensive used inventory of the Pro Juventute issues in two large stock books clean organized. 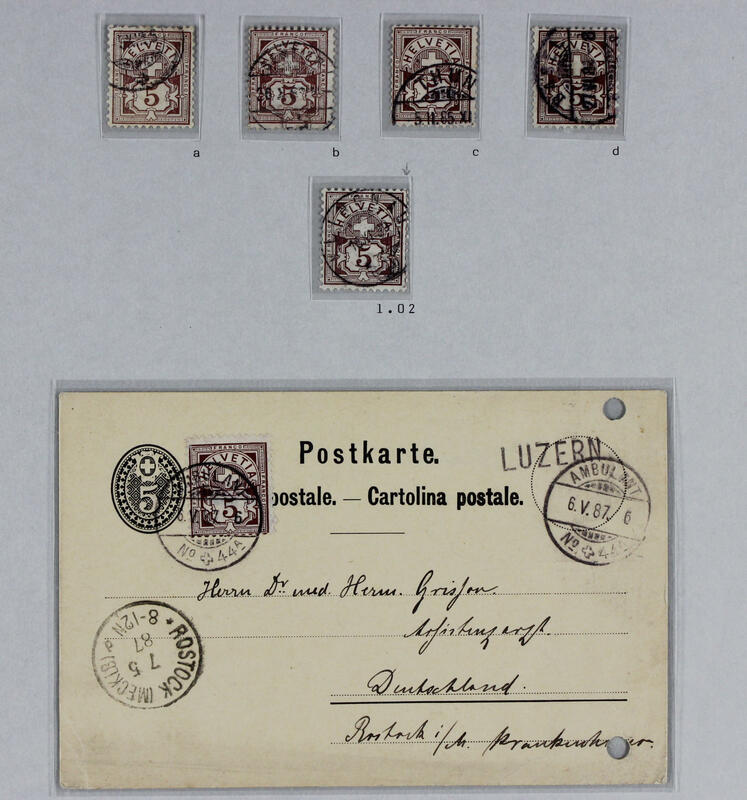 As well better issues as for instance Pro Juventute-forerunner with German inscription, Pro Juventute-forerunner 1912 with French inscription in the horizontal pair centric cancellation \"BERN\" expertized Renggli, the set from 1915 seventeen times complete, the set from 1916 15 times complete, the set from 1917 seventeen times complete, numerous sets of coats of arms, issues the forties, butterfly series extensively present and so on. SBK approximate 41000,- Sfr. 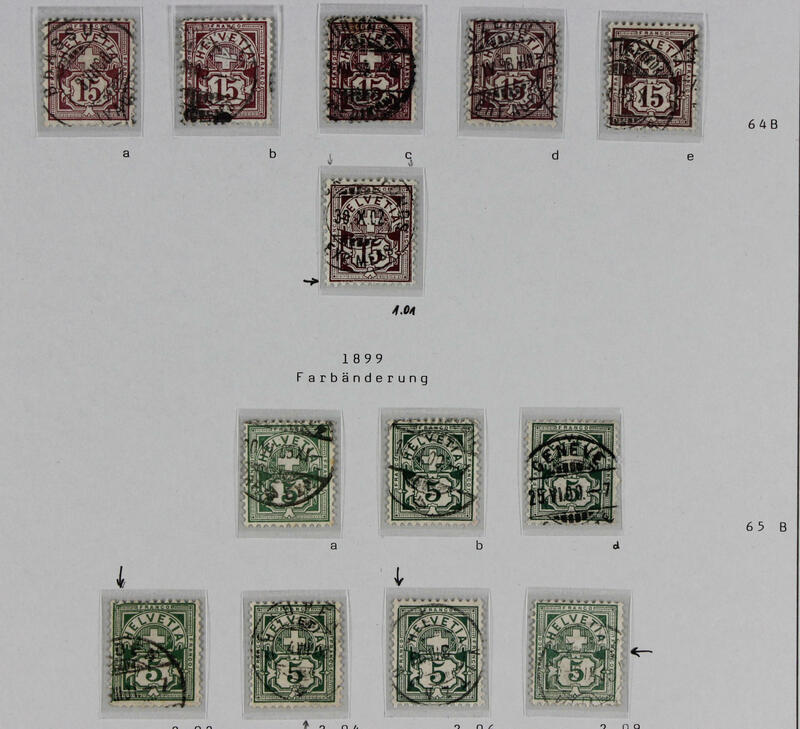 2561 ⊙/ / /✉ Switzerland - 1907 / 43, rich collection in the Lighthouse-Ringbinder with numerous different issues including better values and souvenir sheets. With also nice cancellations, covers and so on. With also the NABA-block 1934 with centered exhibition special cancel, Pro Patria-block 1936, Federal celebration souvenir sheet 1940 neat cancelled, Pro Juventute souvenir sheet 1941 with certificate Liniger, Federal celebration souvenir sheet 1942 nice canceled with certificate Liniger, both Zurich souvenir sheets, Double Geneva souvenir sheet with red special cancel lots and on registered censored letter to Germany, numerous Pro Juventute issues from 1915 and so on. A magnificent object with very high catalogue value! 2563 /⊙/✉ Switzerland / coil stamp for vending machine - 1976 / 91, a very nice and extensive special collection the coil stamp for vending machine in six ring binder formed with an enormous amount of material, as well numerous popular issues, better sets, a plethora of varieties, many nice frankings and so on. With also A1 / 4 mint never hinged, with first day cancel`s, on First Day Cover and on four beautiful airmail letters also the following issues extensively present. An extensive object this attractive area with gigantic acquisition price! 2564 /⊙ Switzerland / souvenir sheets - nice lot of better souvenir sheets in the ring binder. With also Pro Patria-block 1936 mint never hinged and used, Federal celebration souvenir sheet 1940 neat cancelled, butterfly tête-bêche sheet 1953 four times mint never hinged, Imaba souvenir sheet 1948 twice with first day special cancel and so on. Favorable! 2566 ✉ Switzerland / pre-philately - rich collection from pre philately letters, as well without prepaid postage offical letters in two ring binder formed with a lot of material, numerous interesting documents, various cancellations, mixed postmark types, numerous various places and so on. A beautiful and extensive object this attractive area! 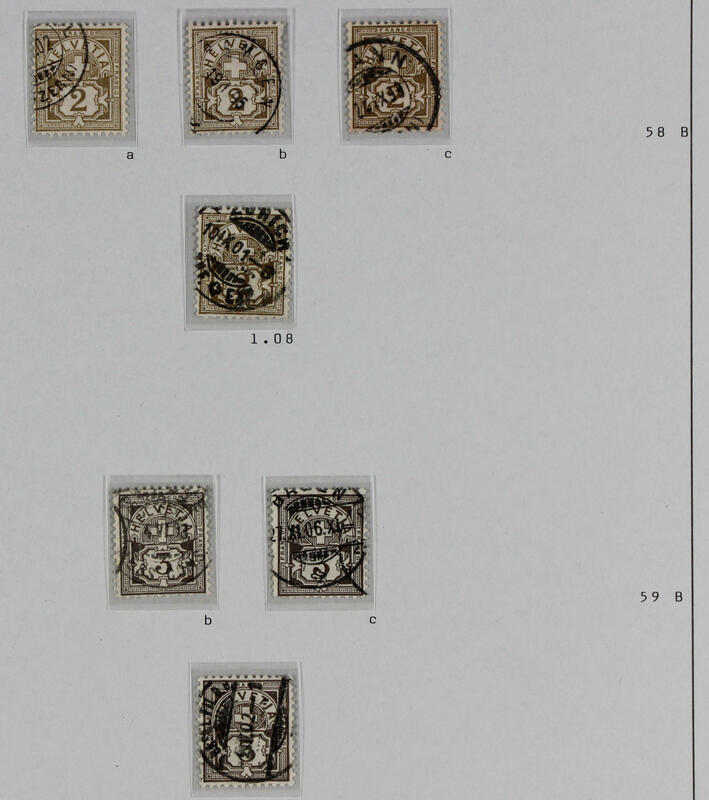 2583 / 121/23 Switzerland - 1907 / 41, very nice and rich collection, clean and maintained in the lighthouse hingeless illustrated album with numerous good issues, as well Helvetia with sword 1908, all eight values landscapes 1914 / 30 including Michel no. 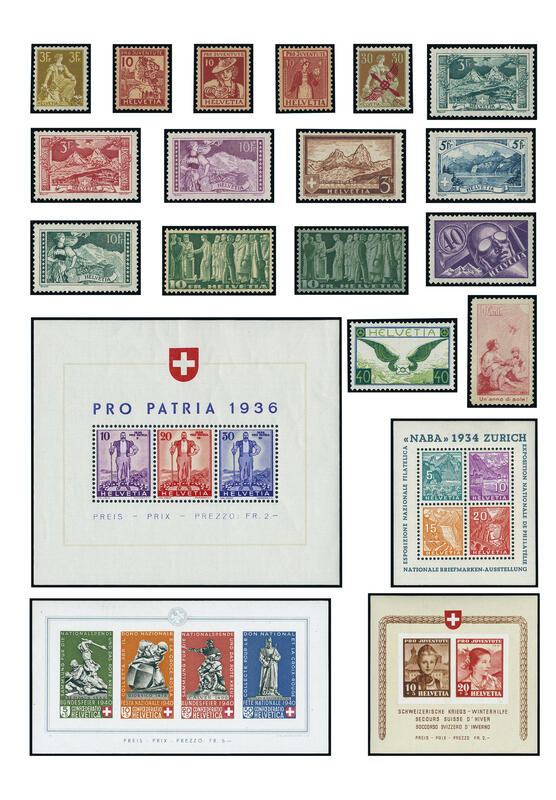 121 / 23, NABA-block 1934, Pro Patria-block 1936, both Zurich souvenir sheets, Double Geneva souvenir sheet, airmail issues with both airscrew overprint value, good sets from the twenties and thirties years, all Pro Juventute issues including the precursor series from 1912, Pro Patria-block 1940 and so on. A very nice object with substance! 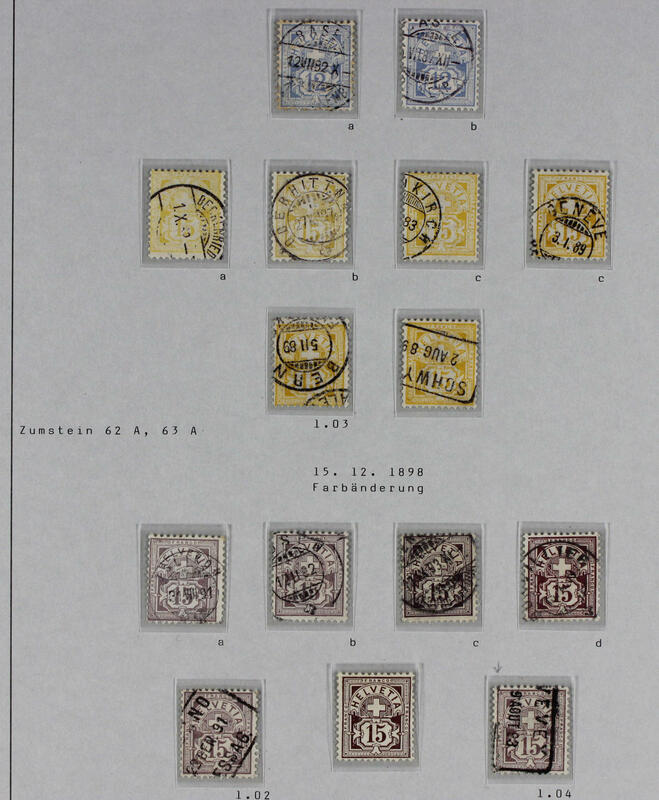 2584 ⊙ Switzerland - 1907 / 89, nice used collection, abundant formed in two lighthouse hingeless printed form albums. With numerous older issues, special- and commemorative sets, souvenir sheets from the forties years, 10 Fr. PAX, war victims souvenir sheet 1945 on registered cover, Bale dove souvenir sheet 1945, Imaba souvenir sheet 1948 on illustrated cover, complete years, numerous Pro Juventute and Pro Patria sets, an extensive part airmail stamps with useful sets from the twenties and thirties and so on. SBK approximate 12000,- Sfr. 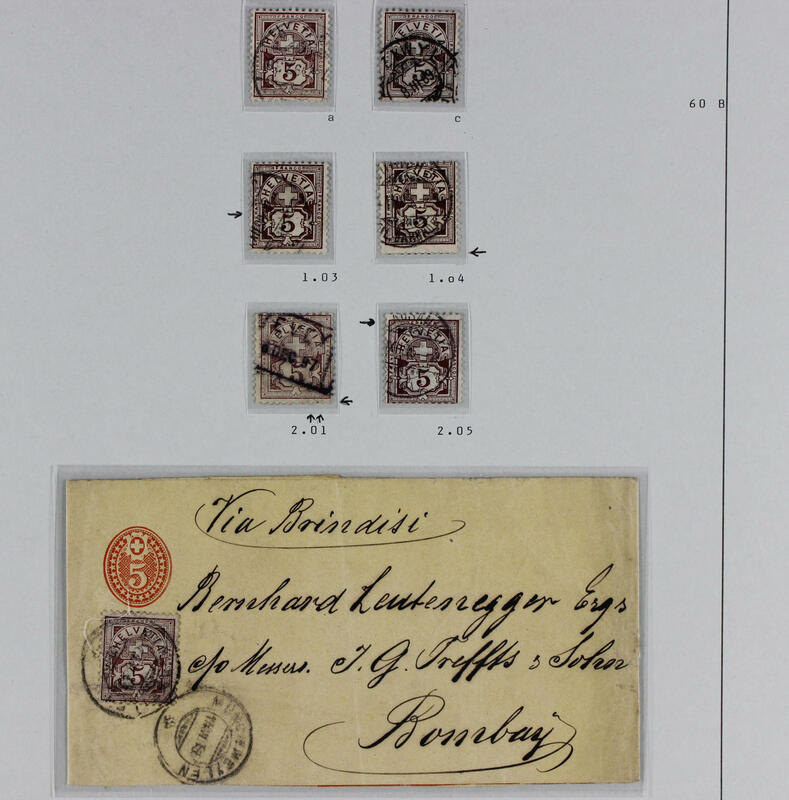 2585 ✉ II Switzerland / lot of letters - interesting lot of covers and cards in three letter albums accommodated. Many attractive documents, also Rayon letters, seated Helvetia, attractive documents Soldier postal service, as well airmail, also the good semi-official airmail stamp from Basle 1913 on special card (Michel no. II) and so on. A delightful inventory, perfect for liquidation!